Wolfrathausen, Germany, December 09, 2014 – EIZO today announced the new Raptor RP5824 – a 57.5-inch 4K ultra HD (3840 × 2160) resolution monitor developed for primary control workstations in air traffic control centers. 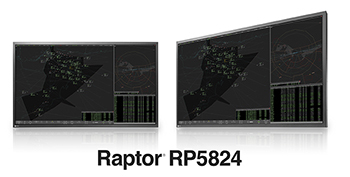 The Raptor RP5824 provides air traffic controllers with the flexibility to display either 4K × 2K ATC data in full or 2K × 2K data and auxiliary information simultaneously* on one screen for a streamlined workflow. This allows controllers to see more information at once without the obtrusive bezels typically found in multi-monitor workstations. Mission-critical redundancy with two power supplies and backlight systems gives the monitor a high degree of operational reliability for creating a fail-safe environment. This ensures the monitor will continue to display data in the unlikely event a component fails. The two independent direct LED backlight systems offer brightness uniformity across the entire screen compared to edge-type backlight solutions. In addition, EIZO’s fully automated brightness stability function uses an internal backlight sensor to stabilize the brightness levels throughout the life of the monitor, compensating for fluctuations caused by variations in ambient temperature and the passage of time. This ensures controllers are always viewing data on the screen with optimal consistency. The Raptor RP5824’s high contrast ratio of 4000:1 provides exceptionally clear images for distinguishing details. The 176° wide viewing angles exhibit minimal change in contrast and hue when the monitor is viewed from off center. This ensures the controller is able see all data from any position without compromising clarity and allows more than one person to view the screen more comfortably. The Raptor RP5824 is now available. Please contact atc@eizo.com for details. EIZO (TSE:6737), which means image in Japanese, is a visual technology company that develops and manufactures high-end display solutions. EIZO integrates hardware and software technologies with consulting, web hosting, and other services to help customers in business, graphics, gaming, medicine, maritime, air traffic control, and other fields work more comfortably, efficiently, and creatively. Headquartered in Hakusan, Japan, EIZO has R&D and manufacturing facilities in Japan, China, Germany, and the US. For more information, please visit www.eizoglobal.com. *Multi-screen support requires EIZO’s Large Monitor Manager. Contact atc@eizo.com for details.